The question of whether Catholics talk enough about Jesus was recently raised on this site. It came up as part of difference of opinion over whether believers of any stripe should be scandalized by expressions of devotion to Mary that don’t mention her divine son in the same breath. Catholic apologist Dave Armstrong was among the first of the parishioners in what Amy Welborn used to call “Saint Blog’s” to write a careful analysis of the prevailing views on those questions. I agree with what Armstrong wrote. But as he implied, and as we saw in a flurry of reader comments about the wisdom of leaning on intercessory prayer when Christians of different confessions talk about death, any paraphrase that simplifies opinions into “Yes, Mary gets too much press” and “No, if we said more about Mary, we’d bring closer people closer to Jesus, also” is inherently problematic, because it assumes the existence of rival camps within Catholicism, which is a faulty premise to begin with. Jesus and his mother are not rivals. 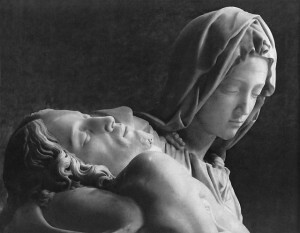 If you doubt that, look again at that magnificent sculpture by Michelangelo, the Pietà. Then consider how much of the rosary is a meditation on episodes in the life of Christ, and re-read the Canticle of Mary (Luke 1:46-55). To hint that Mary and Jesus might be rivals is to misunderstand them both, and to cave wittingly or not to unfounded assertions made by people whose grasp of Catholic teaching is hobbled by animus or ignorance. I’m reminded of a similar problem in the way that Muslim theologians often call Christians “People of the Book”. Many Muslims say this with grudging respect, to keep from pigeonholing Christians with other people whom they regard as “unbelievers”. But the phrase is better as a stroke of public relations than as an accurate summation of what makes Christianity unique. If the bumper sticker that chain-gangs different religious symbols into spelling the word “Coexist” appeals to you, then the Muslim description of Christianity as “of the Book” might also, but it’s wrong, simply because Jesus Himself is the source and summit of Christian faith. If you were illiterate, or stranded on a deserted island with no bible and a poor memory for verses taught in Sunday school, you could still be a Christian, because literacy is not a prerequisite for salvation. What neither Muslims nor certain Protestants understand is that when “sola scriptura” is the doctrine to which you hold fast, then Jesus, like Elvis, has left the building. In other words, as the centurion in scripture who demurred at a house call from Jesus by saying “Lord, I am not worthy to receive you” well knew, premises matter. That said, the question about whether Catholics talk about enough about Jesus is another way of asking whether we evangelize the way we should, or if we live up to the mandate of the Great Commission. You could also think of it as a marker for highlighting the different points of emphasis associated with “high church” and “low church” sensibilities. If you hobnob with Christians of different confessions or recognize the affectionate stereotypes in some jokes, you might suppose that people who attend worship services talk more about Jesus than people who attend liturgies, yet it’s the self-consciously Reformed churches that display crosses rather than crucifixes in their meeting places. Similarly, Pope Benedict recently wrote a two-volume meditation on Jesus. He’s a man with a shepherd’s heart striving to fill a need, and his recent books could be taken to mean that he would agree that we don’t talk enough about Jesus. On the other hand, as anyone who read both volumes knows, the insights that the pope offered are built on a trifecta of prayer, trust in the gospel, and centuries of Christological scholarship, much of which was developed by Catholic and Lutheran theologians from whom the pope quotes. The Lutheran bit is important when you realize that by Southern Baptist or Presbyterian standards, Lutherans probably don’t talk enough about Jesus, either. I said that premises matter. Phrasing does, too, especially in questions that swirl like motes in a sunbeam around the Second Person of the Trinity. Who’s to say what “enough” talk about Jesus is? Or, to quote the great old hymn, while Love is Lord of Heaven and Earth, how can I keep from singing? There’s no disputing that if there were a spiritual analog to the Richter scale, and it was used to measure the force and frequency of “Bible thumping,” then the Catholic Church would jog seismographs less energetically than some other Christian groups do. In some ways, we Catholics take the Bible for granted. But whether that warrants sackcloth and ashes, or is just the equivalent of the old football advice that says when you put the ball in the end zone, you should act like you’ve been there before—well, that’s an open question. Certainly Mariology as a theological discipline owes whatever cachet it has to Catholic and Eastern Orthodox thinkers. But Mariology builds on and is made possible by Christology. However tenuous its Catholic character sometimes seems, there’s still a university in South Bend, Indiana named for “Our Mommy.” But note, please, that the most famous of icon on that campus is the one of “Touchdown Jesus” extending raised arms of blessing over all who pause to give thanks for His gifts. We should talk more about Jesus. But we needn’t throw Mary under a bus, or surrender anything distinctively Catholic, to do so. The Angel Gabriel addressed Mary as “full of grace” even before she had consented to be the mother of our savior. Our destiny as adopted sons and daughters of God is not simply to know Jesus but to commune with Him, body, blood, soul, and divinity. Mary does not impede that communion; she facilitates it. Patrick O'Hannigan is a husband and father whose essays have appeared in American Spectator Online and other places. He lived and worked in California for more than ten years, but writes now from North Carolina.